It’s no secret that big data has led to major changes within the business world. Companies are utilizing the benefits from data analytics to positively impact their bottom line, resulting in growing revenues and greater efficiency. The uses of big data are many and can apply to areas that many might not have thought of before. One area that sees a lot of potential in big data is the mining industry. It’s no secret that big data has led to major changes within the business world. Companies are utilizing the benefits from data analytics to positively impact their bottom line, resulting in growing revenues and greater efficiency. The uses of big data are many and can apply to areas that many might not have thought of before. One area that sees a lot of potential in big data is the mining industry. For an industry that does trillions of dollars in business every year, big data is not seen as a luxury but as a necessity. As mining companies prepare to multiply their investments in IT by five over the next few years, (Tweet This) they’re hoping to see big dividends on the many promises offered by big data analytics. The process of mining is certainly complicated and requires the use of many different pieces of equipment, technologies, and sciences like engineering and geology. Needless to say, with so many different moving parts, the chance for big data to make a big impact is great. One instance of this would be in predicting when mining equipment could fail. This can be accomplished in a proper utilization of the Internet of Things. Equipment would be outfitted with sensors that send back data on its operations in real-time. From that gathered data–which includes information on the equipment’s repair history, fuel consumption rates, and environmental conditions–experts are able to determine if the equipment is in need of repair or at risk of breaking down. By using big data to make these predictions, mining companies would not only increase overall machine reliability, they would improve the efficiency of business operations and end up potentially saving billions of dollars. There are many phases of the mining process where big data can be put to use. The three main ones are the extraction of ore, grinding it down for processing, and separating and concentrating the usable components. Of particular focus for some companies is efficiency improvements in the third phase. The complicated concentration processes requires the use of intricate circuits of pumps and gearboxes embedded with dozens of sensors. These sensors gather multiple points of data every single second and send that data to be analyzed. Based upon the findings, the circuits are optimized to make the most use of their performance abilities. This type of analysis can actually be taken to another level, where a mine’s operating center can actually analyze all circuits and sensors and make sure they are all running at peak performance. Without big data at the heart of this process, there is little chance operators would get as much out of their equipment. Big data may also play a big role in providing for the safety of the miners. 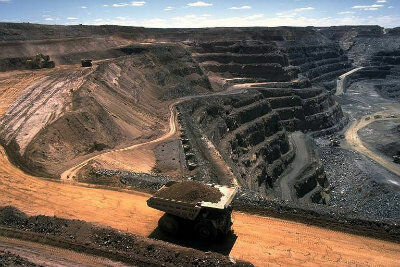 Many mining companies around the world have installed automated ground control systems that are used underground or for pit mining. The sensitive systems capture data on vibrations in the ground and can determine the structural integrity of the mining operation. In the case of real, significant danger such as a tunnel collapse or ground slide, the monitoring system can send out an early warning telling miners to evacuate before any accidents happen. The same data used from ground monitoring can also be applied to the development of safer drill and blasting procedures. Part of the mining process goes beyond what’s done in the mines themselves. One of the areas that may be the most inefficient for mining companies is in the transportation of minerals from the mine to where they’re needed (sometimes referred to as “pit to port”). Much of the data for this transportation comes from the use of rail to move goods to the port. Many of the deficiencies reported by the companies deals with the automated processes of loading rail cars. Big data analytics can help identify where the biggest inefficiencies are, alerting business leaders where improvements are needed. One company, Rio Tinto, announced plans to address this area of weakness by using big data algorithms to load each car to its peak capacity without overloading, thus enabling the company to transport as much material as possible without going overboard. The big data, combined with the faster processing powers and easier scalability of flash storage vs. hard drive space makes all of this possible. The mining industry is only scratching the surface on all the potential stemming from big data. With promises of better safety procedures, increased efficiency and productivity, and lower costs, any company not yet utilizing big data will likely do so soon. For those that are already taking advantage of it, the benefits have become clear with some impressive results.